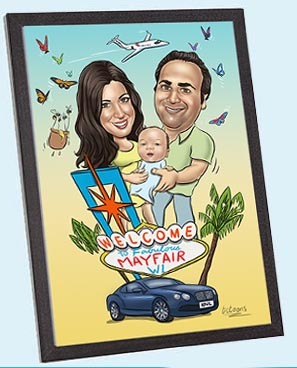 Cartoon portraits make a wonderful personalised gift for birthday's, weddings, retirements, in fact any special occasion. delivered in an A3 size classic Dark grey finished picture frame for an additional charge of £15. 21cm x 29.7cm size picture (A3). It is ready to hang either portrait or landscape view.